A few weeks ago, I took my two boys (Kieran, age 6 and Luke, 3) camping on the North Shore of Lake Superior and at the end of the Gunflint trail. Day 4 of our camping trip found us almost sixty miles away from Lake Superior at the Trail's End campground at the end of the Gunflint Trail. The plan for the morning was to accompany a group of Earth Science teachers and several geology professors on a couple of hikes to sites of geologic importance in the area. The group of teachers were part of TIMES XIV, the TIMES Project is an intensive two-week long class teaching inquiry-based teaching methods and focusing them on Minnesota Earth Science. 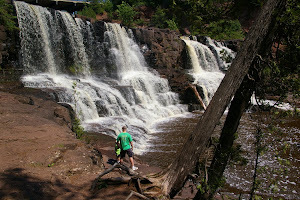 As a past participant of TIMES (summer of 2009) and a member of the Minnesota Earth Science Teachers Association's Board of Directors, we were invited to go along on the days hikes. My job would be to talk Earth Science with the teachers and get to know what they do in their classrooms, while giving them examples of what I do differently as a result of the TIMES Project. Kieran and Luke's job for the day was to follow along and just be themselves, they actually do a great job with long hikes in uneven terrain for kids their age. The day’s hikes were led by Jim Miller, geology professor of the University of Minnesota, Duluth and the Director of the Precambrian Research Center. We met the group in the morning at the Magnetic Rock trailhead, the same place that we had hiked the day before, though we would not be repeating the entire hike this day. Magnetic Rock is a large slab of the Gunflint Iron Formation that was tipped vertically by the late-Wisconsin glaciation. The focus of the day were features found around the 1,878 million year old Gunflint Iron Formation. An iron mine, the Paulson mine, opened near here in the late 1800s, but failed rather quickly because the Mesabi Iron Range (located to the south) was already in operation and a financial panic scared investors in 1893. Before the discovery of iron, early explorers and/or voyageurs to the area, acquired black chert from the iron formation to be used as flint in their black powder muskets. The group hiked approximately half way to Magnetic Rock to view stromatolites that are found along the trail. Stromatolites are nearly circular algal mounds that can be several feet in diameter. While alive, cyanobacteria (the living organism of the stromatolite) grow upward from the seafloor by trapping sediment on a sticky mat. These organisms obtain energy by using the process of photosynthesis, essentially using carbon dioxide and releasing oxygen as a waste product. Stromatolites of this time period are remarkable because of their role in the Great Oxidation Event (GOE). They are the reason that we have the iron deposits around the world, before this period in Earth's history, the level of atmospheric oxygen was very low which allowed soluble iron to build in the world's oceans. As the stromatolites began to release oxygen as a waste product, the iron in the world's oceans basically rusted (or precipitated) out of solution and was deposited on the ocean floor. Stromatolites of this age are found around the world near most of the world's major iron formations. Stromatolites are not unique to just this time period in Earth's history, they are found in many sedimentary rock sequences. The much younger Ordovincian rocks of Southeastern Minnesota also have great examples of stromatolites. They can even be found today in hypersaline waters, where predators are scarce, the best example being Shark Bay in Australia. The next stop for the day was a short drive and short hike away that a catastrophic few hours in Earth's past are recorded in the rock record. Approximately 1,850 million years ago, a meteorite struck near Sudbury, Ontario, almost 450 miles away from Minnesota. It is the second largest impact structure found and very few are older than this impact. The Minnesota outcrops showing evidence of the impact were found because a forest fire raged through the area in 2007 and removed most of the overlying vegetation, making it much easier to see the underlying rocks, especially the breccias of the Sudbury Impact Layer. Essentially, the greater than 10 magnitude earthquakes caused by the impact fractured the iron formation and resulting tsunami re-worked or re-arranged the angular pieces of iron formation. Near the base of the impact layer, these angular fragments are meters in length and cemented together in a green matrix. Near the top of the formation, the size of the iron formation fragments are much smaller. Curiously, Jim Miller explained that iron ceased to be deposited worldwide after the impact. For a much more detailed read on the formation of the impact layer and a history of the impact layer itself, read the document published by the Minnesota Geological Survey. The picture below shows Kieran sitting on the burnt remains of a tree, killed during the forest fire in 2007 that granted accessibility to the Sudbury Impact Layer. This was just about one of the last outcrops that we would visit with the TIMES group, though they would continue on for at least one more stop before returning to the Twin Cities that evening. It is located just a short hike down National Forest Service Road 1347 from the previous stop. At this particular outcrop, you are able to stand near the uppermost portion of the Sudbury Impact Layer. Deposited here are accretionary lapilli, essentially ash pellets that were thrown away from the impact site. Using very high powered microscopes, shocked quartz (which is only found at impact sites) can be found in these centimeter-sized pellets, commonly called ejecta, and the surrounding matix. Look for the small, concentric circle structures in the pictures below. Many of the teachers in the group we were accompanying were amazed that two boys, like Kieran and Luke, could go through some of these hikes at their age. A few were even surprised that they could camp in locations like these, this isn't a state park with a lot of people, it's fairly remote and there is no cell phone reception or any technology that we're used to using. Both boys tend to do a great job doing their own thing when camping in locations like these and dad got a few hours of adult interaction (a very rare thing for a week-long father/son camping trip).